Envisage – if you will – the tourism of the future, and no I don’t mean some Richard Branson utopian form of space tourism, I mean the kind of Star Trek tourism where you could beam yourself into another life for a day, Total Recall style. Imagine if science fiction came true and you could be just like Arnie – you could buy yourself a piece of memory revealing the idyllic escapade of a lifetime. There would be no environmental problems, no harmful detriments on society, not a centimeter of construction or pollution involved, and no greedy conglomerates to steal profit or culture from the locals. Welcome to the future, welcome to ecotourism. Actually, in all honesty you can just go straight on imagining, because my allegorical metaphor isn’t specifically exact, but ecotourism does mange to alleviate some of these problems. I am sure most people have heard of ecotourism by now and it really is a love or hate concept. You either take the hedonistic ‘live life, screw the environment’ standpoint or stand on the opposing ‘bored of classical tourism, let’s have an authentic experience and save the environment at the same time’ side. I may refer to the latter stance sarcastically, but really whomever ecotourism attracts; the eventuality does more good than harm. Situated a leisurely drive away from Bangkok are a handful of unique home-grown Thai wineries which have slowly been gaining praise with wine-drinkers around the globe and, despite the government’s strict stance on alcohol, things are looking better than ever for the budding local wine scene. It’s a late Sunday afternoon and a gingery orange hue slowly turns to a bloody red in the sky above miles of lush budding grape fields. Below, some fortunate individuals sit around a table covered in wine bottles, contentedly sampling a batch of matured grapes fresh from the latest harvest. If trite clichés had their way, this romantic scene would most likely be set in Bordeaux or Tuscany, but this is far from the case, as just beyond the table of wine-drinkers a full-grown elephant assisting with the grape-picking breaks the stereotype – and further on just over a hundred kilometers away from the wine fields is Bangkok, where the rush hour traffic scarcely percolates through busy streets whilst the wine bars and lounges begin to fill up as twilight sets in. Wines are fairly new to the Bangkok drinking scene, but local taste buds have been maturing more rapidly in recent years as the city, and the country, quickly develops. Wine drinking is now de rigeur in Thai society and, in line with Asia’s burgeoning levels of wine consumption, just about every bar and hotel worth visiting in Bangkok now boasts an erudite selection of wine. This is the same story in other popular spots around the country as well. Official figures indicate current Thai wine consumption to be at 12-14 million liters per annum, and it has been growing at a steady rate of about 6.5% per year since the millennium. 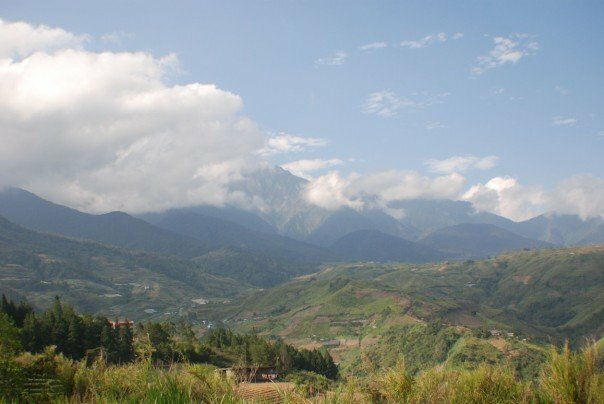 This uniqueness is, in part, due to the geography of the country which causes the few select wineries that operate to run in the mountains around Thailand and the valleys in the northern part of the country where the weather is cooler. Although Thailand is a tropical country, these higher altitude areas provide a predominantly subtropical climate which is almost ideal for winemaking. Prayut Piangbunta, the director and chief winemaker from Khao Yai Winery – another of the leading Thai wineries – knows this more than any and he explains that, “Thailand is the only country in the Northern Hemisphere which has the same harvesting period as the South, and this creates a perfect environment for grapes to grow, with dry cool nights and warm sunny days.” Being close to the equator, Thailand’s latitudes fall between 10 and 20 degrees (in contrast to the typical old-world wine-making standard of 30 to 50) and, as one would imagine, this is not your average wine-producing environment – this is the world of ‘New Latitude Wine.’ Contrary to viticulturalist beliefs, Thailand wineries are perfectly capable of growing many types of grapes, though the subtropical climates are more suitable for grapes with high acidity. As Jirachai Sethisakko – the Group Wine Guru for Anantara – highlights, “The quality of Thai wines is comparable to mid-range Chilean wine and an entry-level Australian Shiraz. 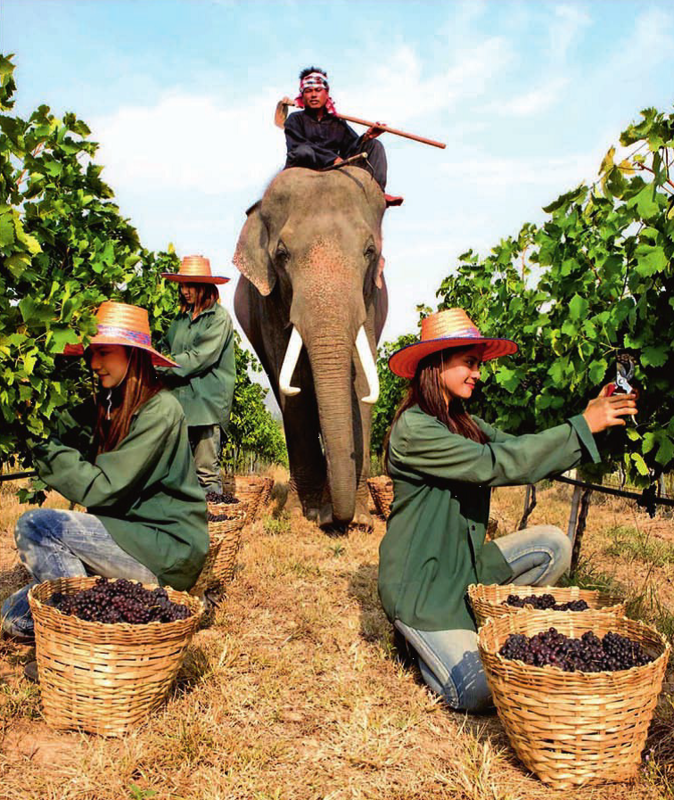 In the industry everyone knows that Thailand has some of the most distinctive wineries in the industry, and the ideal grape-growing conditions even allow some wineries to produce two harvests a year. In this world of ‘New Latitude Wine’ the wine production season runs from November to March and harvesting takes place from January to late March. Labor is cheap and grape-picking often takes place at night to avoid the heat of the day. However, the exceptionality of the ‘New Latitude Wine’ world is not just limited to technical details. This is also a world where there are floating vineyards that workers must harvest by boat, and a world where elephants aid the grape-pickers – this is wine-making with a difference. Chile is the perfect yard post to measure the Thai wine scene against, since it is a young wine country with a similar climate that produces similar wines, and that also once lacked the education to create good wine and was plagued by tax problems. However, though Chilean alcohol taxes were dropped (and the wine Chilean industry subsequently saved) in the 1980s, excessively high taxes and a strict governmental stance on alcohol are hindering the growth of the local Thai wine scene. “The Thai government is very strict with alcohol advertising. Thailand wine deserves better and more publicity from local press but they cannot publish pictures of bottles or write about wine except for education,” says Joe Sriwarin, the editor of Wine Today magazine. In spite of everything though, the local Thai wines are doing extremely well outside of Thailand and, with Thai wines being undoubtedly some of the best to come out of Asia, the future nevertheless looks bright for this new world of newer New World wines.